Step by step instructions for the use of Zotero citation management software. Refers to the downloaded Zotero software on your computer. Is the fully online version of Zotero (www.zotero.org). Folder(s) that house your items. 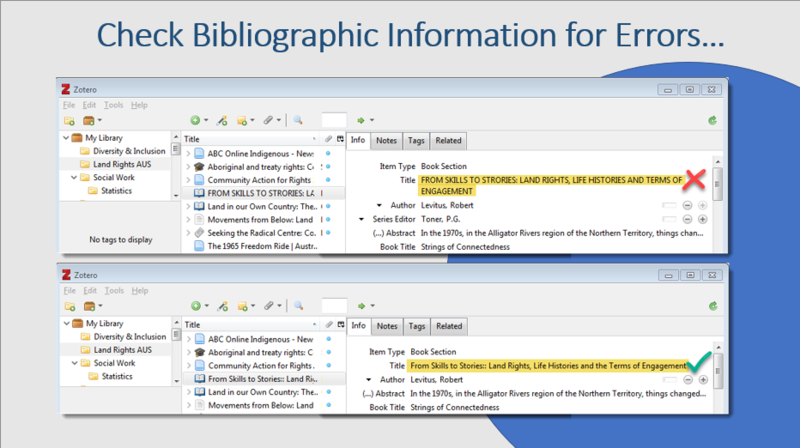 Bibliographic information such as, item type, author, title, source URL, notes, tags, etc. 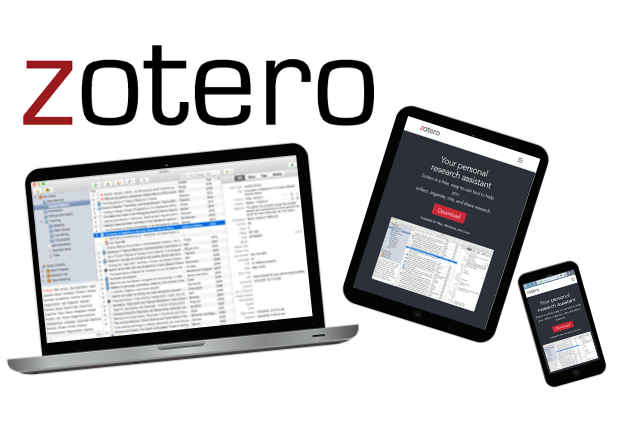 Zotero is a free reference manager, designed to store, manage, and cite bibliographic references, such as books, articles, videos, legislation, podcasts and webpages. 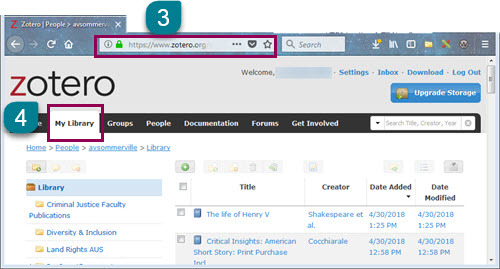 Use a web browser with the Zotero Connector installed, conduct a search using one of the library databases or website. Zotero automatically senses the content present in your web browser, as you search. Locate resource you want to save and look for the Zotero Icon in your browsers address bar or next to it. 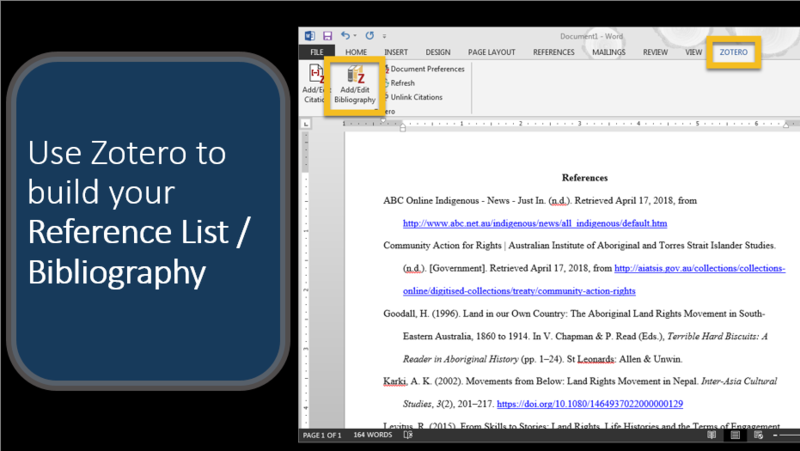 Clicking the icon to adds the item’s bibliographic information to your Zotero Library. Check the item record accuracy, pay close attention to names, dates, capitalization, punctuation, etc.. you will also want to add any missing information needed for an accurate citation. 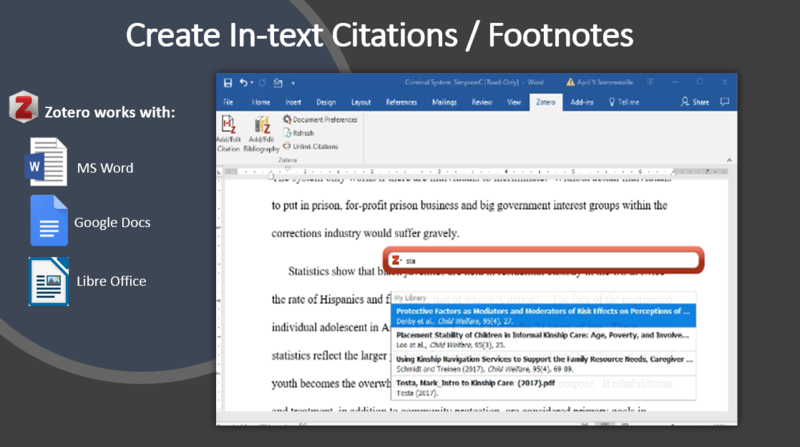 As you write your paper, use Zotero to insert in-text citations/footnotes from your personal library. When you're done, use Zotero to build a Reference List/Bibliography from the in-text citations/footnotes used in while you wrote. 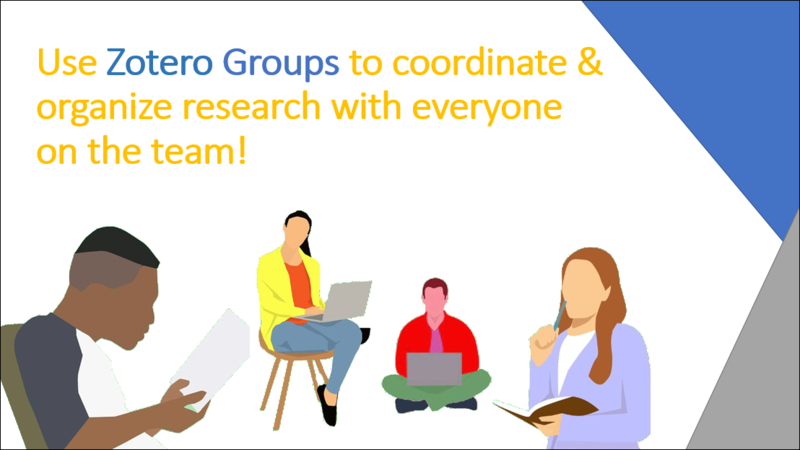 Zotero Groups is a collaborative tool that allows members of the group to add to and edit a common library, making it possible to work together remotely and in real-time. 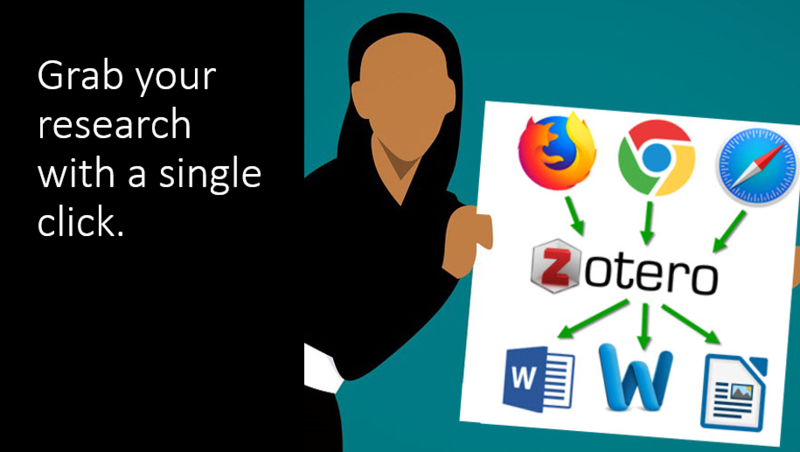 You should download and install both, the Zotero Standalone 5.0 (desktop application software) AND a Zotero Connector for your preferred web browser. You are able to access/manage all citations online when logged on to zotero.org, but some functionality and special features, like folder importing/exporting, are only available when using Zotero Standalone. The browser connector will allow you to save items to your Zotero Library from your browser. The mobile version of zotero.org allows you to access and edit your Zotero library on your tablet or mobile phone. See the Using Zotero with a Tablet/Mobile Device tab of this guide for info about additional steps. After you download the software and browser connector, register for a free account. 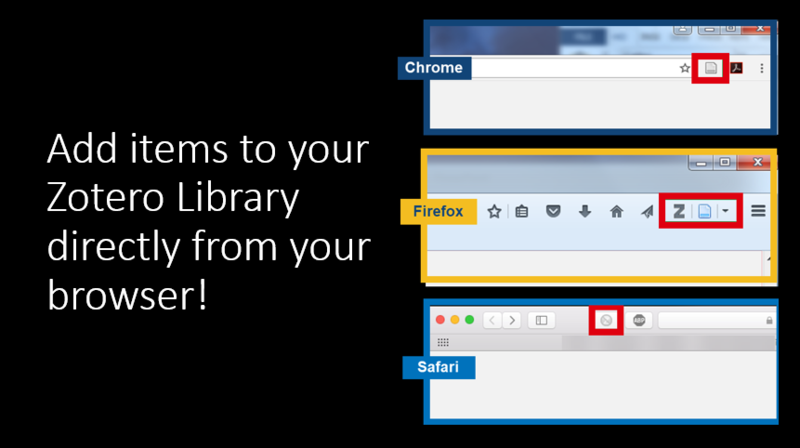 View your personal library from multiple computers and devices. Use the groups function when working on group projects. Each member can add or edit items and easily communicate via the items notes section. Back-up your collection on the Zotero server (you get 300MB for free and can purchase additional storage). If you're regularly using more than one computer or device in your research, Zotero's sync feature can keep your library up to date on all of them. Zotero can store a copy of your library on the Zotero.org server and check it for updates whenever you open your library on a different computer. 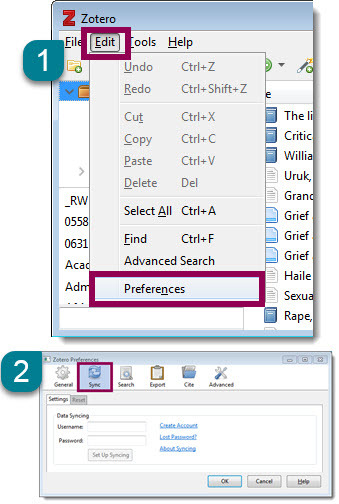 Open your Zotero Standalone and find the Edit option in the top left, select Preferences. Select the Sync option, enter your username and password from your online account. Then click OK.
Open a browser window, and go to www.Zotero.org and login. 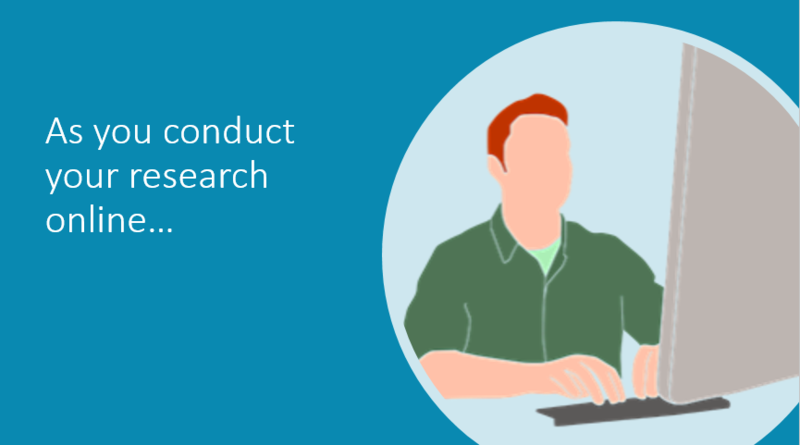 Select the My Library tab to view your collection of citations. These should match the list of citations from your Zotero Standalone. The initial syncing should happen within a few minutes, if you do not see your citations included try refreshing your browser cache and reloading the page.